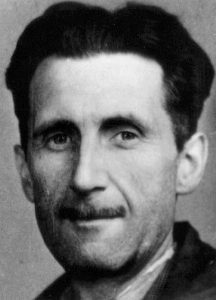 Special Report: Official Washington’s rush into an Orwellian future is well underway as political and media bigwigs move to silence Internet voices of independence and dissent, reports Robert Parry. Under the cover of battling “fake news,” the mainstream U.S. news media and officialdom are taking aim at journalistic skepticism when it is directed at the pronouncements of the U.S. government and its allies. One might have hoped that the alarm about “fake news” would remind major U.S. news outlets, such as The Washington Post and The New York Times, about the value of journalistic skepticism. However, instead, it seems to have done the opposite. 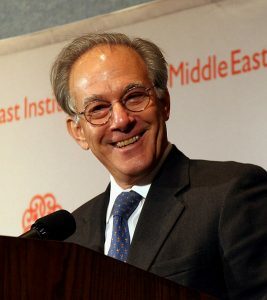 So, we have the case of Washington Post columnist David Ignatius (pictured below, photo credit: Aude) having a starry-eyed interview with Richard Stengel, the State Department’s Undersecretary for Public Diplomacy, the principal arm of U.S. government propaganda. Entitled “The truth is losing,” the column laments that the official narratives as deigned by the State Department and The Washington Post are losing traction with Americans and the world’s public. Stengel, a former managing editor at Time magazine, seems to take aim at Russia’s RT network’s slogan, “question more,” as some sinister message seeking to inject cynicism toward the West’s official narratives. Typical of these recent mainstream tirades about this vague Russian menace, Ignatius’s column doesn’t provide any specifics regarding how RT and other Russian media outlets are carrying out this assault on the purity of Western information. It’s enough to just toss around pejorative phrases supporting an Orwellian solution, which is to stamp out or marginalize alternative and independent journalism, not just Russian. Ignatius writes: “Stengel poses an urgent question for journalists, technologists and, more broadly, everyone living in free societies or aspiring to do so. How do we protect the essential resource of democracy — the truth — from the toxin of lies that surrounds it? It’s like a virus or food poisoning. It needs to be controlled. But how? Yet, what Stengel and various mainstream media outlets appear to be arguing for is the creation of a “Ministry of Truth” managed by mainstream U.S. media outlets and enforced by Google, Facebook and other technology platforms. In other words, once these supposedly responsible outlets decide what the “truth” is, then questioning that narrative will earn you “virtual” expulsion from the marketplace of ideas, possibly eliminated via algorithms of major search engines or marked with a special app to warn readers not to believe what you say, a sort of yellow Star of David for the Internet age. On the other hand, if you do toe the official line that comes from Stengel’s public diplomacy shop, you stand to get rewarded with government financial support. Stengel disclosed in his interview with Ignatius that his office funds “investigative” journalism projects. After reading Ignatius’s column on Wednesday, I submitted a question to the State Department asking for details on this “journalism” and “truth-telling” funding that is coming from the U.S. government’s top propaganda shop, but I have not received an answer. But we do know that the U.S. government has been investing tens of millions of dollars in various media programs to undergird Washington’s desired narratives. USAID estimated its budget for “media strengthening programs in over 30 countries” at $40 million annually, including aiding “independent media organizations and bloggers in over a dozen countries,” In Ukraine before the 2014 coup ousting elected President Viktor Yanukovych and installing a fiercely anti-Russian and U.S.-backed regime, USAID offered training in “mobile phone and website security,” skills that would have been quite helpful to the coup plotters. USAID, working with currency speculator George Soros’s Open Society, also has funded the Organized Crime and Corruption Reporting Project, which engages in “investigative journalism” that usually goes after governments that have fallen into disfavor with the United States and then are singled out for accusations of corruption. 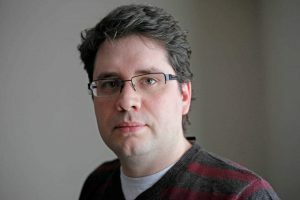 The USAID-funded OCCRP collaborates with Bellingcat, an online investigative website founded by blogger Eliot Higgins. Higgins (right) has spread misinformation on the Internet, including discredited claims implicating the Syrian government in the sarin attack in 2013 and directing an Australian TV news crew to what appeared to be the wrong location for a video of a BUK anti-aircraft battery as it supposedly made its getaway to Russia after the shoot-down of Malaysia Airlines Flight 17 in 2014. Despite his dubious record of accuracy, Higgins has gained mainstream acclaim, in part, because his “findings” always match up with the propaganda theme that the U.S. government and its Western allies are peddling. Higgins is now associated with the Atlantic Council, a pro-NATO think tank which is partially funded by the U.S. State Department. Beyond funding from the State Department and USAID, tens of millions of dollars more are flowing through the U.S.-government-funded National Endowment for Democracy, which was started in 1983 under the guiding hand of CIA Director William Casey. NED became a slush fund to help finance what became known inside the Reagan administration as “perception management,” the art of controlling the perceptions of domestic and foreign populations. 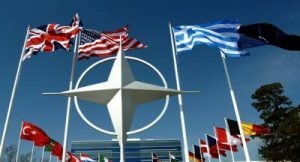 Last year, as the New Cold War heated up, NATO created the Strategic Communications Command in Latvia to further wage information warfare against Russia and individuals who were contesting the West’s narratives. On Wednesday, U.S. congressional negotiators approved $160 million to combat what they deem foreign propaganda and the alleged Russian campaign to spread “fake news.” The measure is part of the National Defense Authorization Act and gives the State Department the power to identify “propaganda” and counter it. 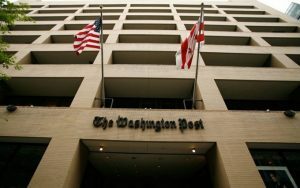 This bipartisan stampede into an Orwellian future for the American people and the world’s population follows a shoddily sourced Washington Post article that relied on a new anonymous group that identified some 200 Internet sites, including some of the most prominent American independent sources of news, as part of a Russian propaganda network. Typical of this new McCarthyism, the report lacked evidence that any such network actually exists but instead targeted cases where American journalists expressed skepticism about claims from Western officialdom. Also on the “black list” were such quality journalism sites as Counterpunch, Truth-out, Truthdig, Naked Capitalism and ZeroHedge along with many political sites ranging across the ideological spectrum. Normally such an unfounded conspiracy theory would be ignored, but – because The Washington Post treated the incredible allegations as credible – the smear has taken on a life of its own, reprised by cable networks and republished by major newspapers. But the unpleasant truth is that the mainstream U.S. news media is now engaged in its own fake-news campaign about “fake news.” It’s publishing bogus claims invented by a disreputable and secretive outfit that just recently popped up on the Internet. If that isn’t “fake news,” I don’t know what is. Yet, despite the Post’s clear violations of normal journalistic practices, surely, no one there will pay a price, anymore than there was accountability for the Post reporting as flat fact that Iraq was hiding WMD in 2002-2003. Fred Hiatt, the editorial-page editor most responsible for that catastrophic “group think,” is still in the same job today. 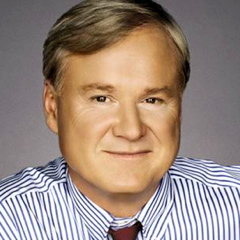 Two nights ago, MSNBC’s Chris Matthews (left) featured the spurious Washington Post article in a segment that – like similar rehashes –didn’t bother to get responses from the journalists being slandered. I found that ironic since Matthews repeatedly scolds journalists for their failure to look skeptically at U.S. government claims about Iraq possessing WMD as justification for the disastrous Iraq War. However, now Matthews joins in smearing journalists who have applied skepticism to U.S. and Western propaganda claims about Syria and/or Ukraine. While the U.S. Congress and the European Parliament begin to take action to shut down or isolate dissident sources of information – all in the name of “democracy” – a potentially greater danger is that mainstream U.S. news outlets are already teaming up with technology companies, such as Google and Facebook, to impose their own determinations about “truth” on the Internet. Or, as Ignatius puts it in his column reflecting Undersecretary for Public Diplomacy Stengel’s thinking, “The best hope may be the global companies that have created the social-media platforms. 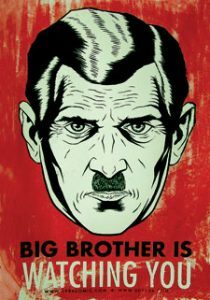 Big Brother poster illustrating George Orwell’s novel about modern propaganda, 1984. The New York Times has even editorialized in support of Internet censorship, using the hysteria over “fake news” to justify the marginalization or disappearance of dissident news sites. Yet, in my four decades-plus in professional journalism, I always understood that skepticism was a universal journalistic principle, one that should be applied in all cases, whether a Republican or a Democrat is in the White House or whether some foreign leader is popular or demonized. As we have seen in recent years, failure to ask tough questions and to challenge dubious claims from government officials and mainstream media outlets can get lots of people killed, both U.S. soldiers and citizens of countries invaded or destabilized by outsiders. To show skepticism is not the threat to democracy that Undersecretary Stengel and columnist Ignatius appear to think it is. Whether you like or dislike RT’s broadcasts – or more likely have never seen one – a journalist really can’t question its slogan: “question more.” Questioning is the essence of journalism and, for that matter, democracy. Find out about our great (WOW) TLB Project Membership package and benefits, add your voice and help us to change the world!